Luftwaffe fighter units stationed in Italy were under the overall command of the Jagdfliegerführer Oberitalien Obst. Günther von Maltzahn. The units were occasionally rotated back to Germany for a period of rest and recuperation, or transferred to other theatres of operations, but their core remained largely unchanged: I./JG 4; II./JG 51 ‘Mölders’; the entire complement of JG 53 ‘Pik As’, as well as Stab, I. and II./JG 77 ‘Herz As’ (2. and 3./JG 2 ‘Richthofen’ served only briefly during operations over the Anzio beachhead). In September 1944, Obst. Eduard Neumann was appointed the new Jafü Oberitalien. Around that time the last Luftwaffe fighter units – Stab. and II./JG 77 – left for Germany. Henceforth, the air defence of northern Italy was left to the ANR units, albeit still commanded by the Germans. Throughout their campaign in Italy the Luftwaffe mainly operated Messerschmitt Bf 109 Gs (Focke-Wulf Fw 190 As appeared only briefly with 2. and 3./JG 2). Generally speaking, all the Luftwaffe fighters were finished in the standard RLM 74/75/76 colour set. Only during the early, transitional period could any major variations be observed, such as desert camouflages, or cases where the standard set of colours was supplemented with freely applied brown patches and stripes, as in the case of JG 4. Nevertheless, minor differences abounded. Fuselage sides were at times toned down with additional colours (e.g. RLM 02). The Bf 109s operated by I./JG 53 could be distinguished by the unit’s predilection for defining the colour demarcations on the upper wing surface (RLM 74 and 75) with a ‘sawtooth’ pattern. This was most likely applied with a spray gun and stencil. Moreover, some elements (fuselages, tailfins) were painted in a manner unique to their manufacturer. National markings of that period were reduced to white elements on the wings, and fuselage crosses were no longer outlined in black (though some older aircraft featured the old style, high-visibility Balkenkreuze). The Axis Mediterranean theatre markings consisted of a white fuselage band with a yellow lower cowling. In late 1943 some Bf 109 G-6s featured white lower wingtips, like ‘Black 16’ of III./JG 53, presented herein. Other markings, such as unit emblems, victory bars, and pilot individual badges followed fashions known from other theatres of operations. With the possible exception of the Pacific region, the Mediterranean theatre was the most colourful war zone as far as the allied air force was concerned – in both the literal and the figurative sense. In November 1943 the MAAF (Mediterranean Allied Air Forces) headquarters had under their command a variety of units staffed by pilots of many nationalities: American, British, French, Canadian, Australian, Polish, Greek, Italian (of Aviazione Cobelligerante Italiana), and even Brazilian. 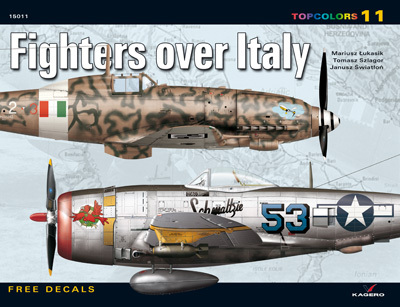 As of 8th May 1944, 41 allied fighter squadrons were serving in Italy. They operated a number of different aircraft types: Spitfire Mk Vs, VIIIs and Mk IXs, Curtiss P-40 Kittyhawks and Warhawks, P-38 Lightnings, P-39 Airacobras, P-47 Thunderbolts, P-51 Mustangs, and even Macchi MC.205s (flown by the co-belligerent units). Some of the aircraft were veterans of the campaign in North Africa, and their camouflages gave evidence of it. Around that time the USAAF units began to operate aircraft in natural metal finishes, and on some older machines the olive-drab camouflages were removed. Aircraft attached to RAF units that had participated in the earlier Mediterranean campaigns wore a camouflage of Dark Earth/Mid Stone over Azure Blue. National markings consisted of the standard roundels on the fuselage and wings, with tail fin-flashes. Tactical markings were three-character codes, the first two characters denoting a particular squadron, and the third character identifying an individual aircraft. Pilot and unit badges were relatively inconspicuous (especially when compared to the flamboyant American style); some aircraft sported victory markings. Once in Italy, the RAF reverted to the standard Day-Fighter colour set of Ocean Grey / Dark Green over Medium Sea Grey, but the two paint schemes (Temperate and Mediterranean) continued to co-exist for quite some time. The camouflage used on USAAF aircraft that had participated in the Tunisian campaign followed the same pattern. National insignia included the standard white stars on dark blue discs, with white bars bordered in dark blue in four positions: on either side of the fuselage, on the port wing upper surface, and on the starboard wing underside (Warhawks of the 79th FG continued to carry RAF-style fin-flashes). Aircraft in the ‘continental’ camouflage had Olive Drab upper surfaces, and Neutral Grey undersides. American fighter groups adopted high-visibility, unit-specific colour markings (usually found on the tail assemblies). Quick aerial recognition markings (like those carried by Axis fighters) were not common. Notably, many P-51s and P-47s featured single or double yellow wing bands to distinguish them from Axis fighters. American aircraft were famous for their elaborate ‘nose-art’ – cartoon characters and scantily clad ladies being the most popular themes. Victory and mission markers (the former usually in the form of crosses or swastikas) were usually painted beneath the cockpit. Fortunately, this intricate subject is well documented in photographs: hence, it will be continued in a second volume of ‘Fighters over Italy’.